the spoils of the garden. 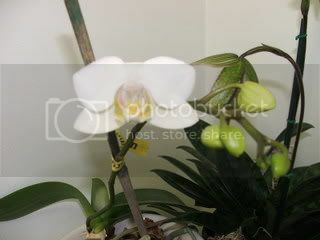 here are the photos of my orphan rescued orchid that finally rewarded me with a flower this year. 3 years of TLC. looks like many more flower sites as well. hope you enjoy. 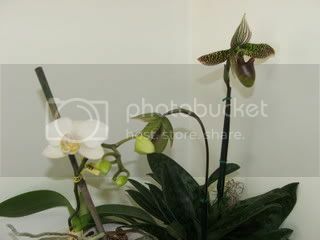 If any orchid enthusiasts would care to share any tips or suggestions i am open to it. being generally happy with the same temperature ranges that keep us happy. unless it were to catch a few rays of early morning or early evening sun. that is so lovely. I tried many years ago to grow orchids in Namibia. I decided to give up. I still admire them though. whatever you are doing that is very good. I think I could do with some advice from YOU not the other way around!! 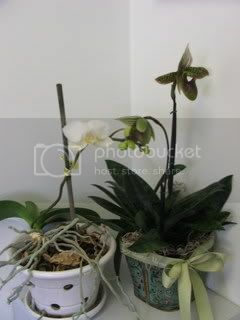 You certainly seem to be doing all the right things for your orchids whereas I seem to be murdering mine. Thank goodness we don't have a homicide squad looking for plant killers!!! Strabgely enough it's about the only kind of plant I give the kiss of death to - everything else seems to thrive. 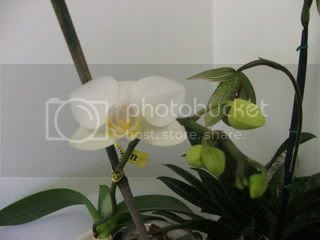 You really have greenfingers when it comes to growing orchids and your photographs are lovely. Well worth the wait Todd, thanks so much for posting this beauty. What beauties Todd, looks like you are doing everything right.